The capital city of North Jeolla Province is loved not only for its urban appeal but also for its proximity to the open green expanses of Wanju County. Jeonju is famous for being the birthplace of both the Joseon dynasty and Korea’s most famous culinary delight: bibimbap (rice, meat and vegetables with hot sauce). Bibimbap has even acquired international recognition – In May 2012, it was listed on UNESCO’s Creative Cities Network as one of its Creative Cities for Gastronomy. Home cooking handed down through the generations is a time-honoured tradition in the city and talented chefs and food festivals abound. Aesthetically Jeonju is wonderful. Its traditional, slate roofs curl up gently towards the sky and whitewashed, mud walls and quiet courtyards characterise the town’s hanok, traditional homes belonging to the Korean upper class. Around 800 of them line a patchwork of cobblestone lanes in Jeonju Hanok Maeul, right in the centre of the city. Not many are lived in today but they now house interesting museums, guesthouses, art workshops, teahouses and boutiques. It might be a little touristy, but strolling through the cobblestoned streets is enchanting, particularly in the early morning or evening hours. How about a warming bowl of delicious rice topped with vegetables, chilli sauce and an egg? This is one of Korea’s most popular dishes and Jeonju is where it all started. Bibimbap comes in many varieties and as the Koreans say: food in general tastes best in Jeonju so it would be a shame not to try bibimbap here. The local specialty is bibimbap served with mung bean sprout jelly. Not happy to stop at bibimbap, Jeonju boasts a very busy street food scene, popular among all travellers. Classic treats include wholewheat hotteok (griddle cakes), fried squid and an ever-growing selection of new recipes. On Friday and Saturday nights, join the crowds as they indulge till late at the night market. 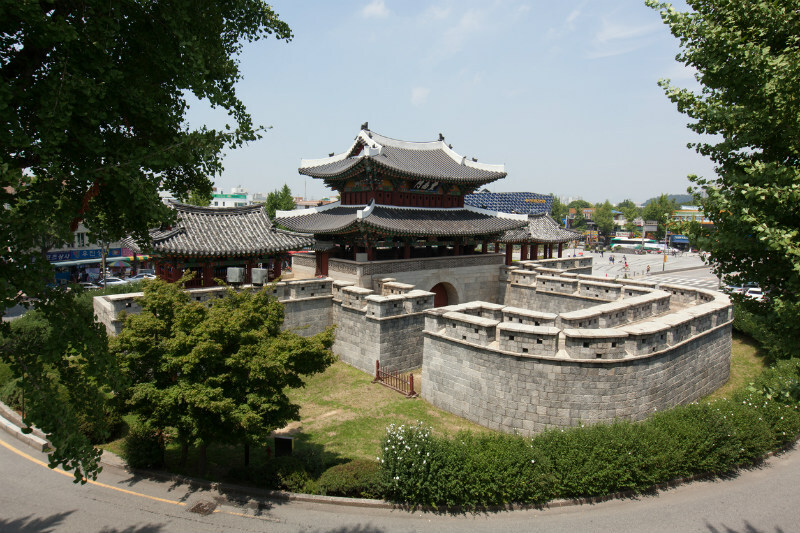 Dating back to 1410 the palace of Gyeonggijeon was reconstructed in 1614 and houses shrines for the Confucian rituals once held here. 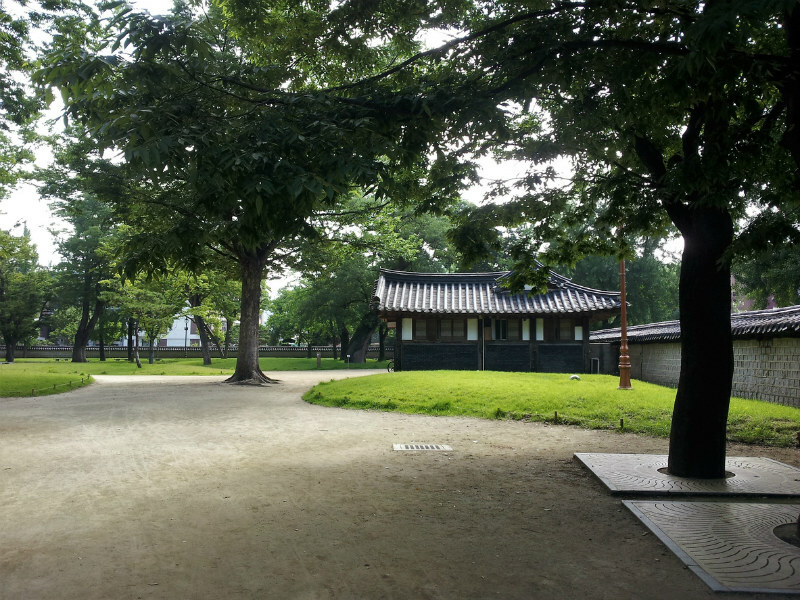 It’s a tranquil place where you won’t find manicured gardens; instead, a modern museum holding portraits of King Tae-jo and other kings along with a carriage used to move the mortuary tablets. You’ll also find carriages which transported dignitaries as well as individual chair-like carriages of old. Marvel at the beautiful architecture, soak up the well-presented information and take the opportunity to dress up in traditional Korean attire, if the mood takes you. English tours are held daily. This unique little village on a hill overlooking Hanok Maeul takes street art to new levels. At every turn you will find colourful and eclectic murals – sometimes on entire houses. Although it is a fairly steep walk up to Jaman Village, you can take it slowly and enjoy the vibrant designs on the painted buildings along your way. Many works display excellent levels of art – they are unconventional and maintain a refreshing amount of individual personality. Jeonju’s city park centres round a natural pond and is particularly famed for its lotus flowers which bloom in the pond. But lotus blooms aren’t the only attraction: The Park hosts the annual Dano Changpomul (Water Iris) festival, a much-loved event held on the day of Dano, a Korean holiday falling on the fifth day of the fifth lunar month. During Dano Changpomul, women wash their hair in iris-infused water from the pond in order to bring good health in the coming year. This sizeable park spans an area of 13,000 square metres, while the pond covers around two thirds of the southern part of the park. Cross the elegant, arch-shaped suspension bridge spanning the middle of the pond for close-up views of the lotus blossoms, and try and visit in lotus blossoming season (mid-July to early August). Why not join the Korean couples and hire paddle boats and glide gently amid the lotus lilies? Alternatively, take a gentle walk along the lakeside path.